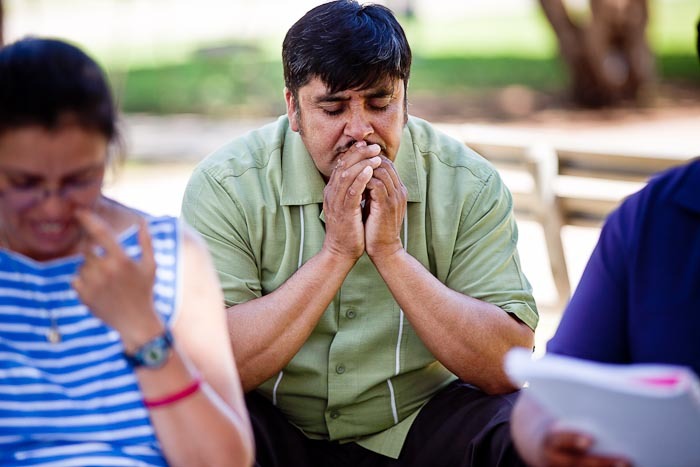 A group of immigrants’ rights and civil rights activists are holding a prayer vigil at the Arizona State Capitol. They gather at 5 AM and pray until 10 PM, when they retire to a nearby Catholic church. The vigil is to draw attention to SB 1070, Arizona’s tough new anti-immigrant law. Civil rights activists are concerned the law will lead to racial profiling and the persecution of Hispanics - citizens, legal residents and undocumented alike. Along that line, Sean Hayes, hosting the Tony Awards this evening, landed a good one at Arizona’s expense when he joked with Nathan Lane, who plays Gomez in the Addams Family Musical on Broadway, that being Latino in New York gets you overlooked but being Latino in Arizona gets you pulled over. It may have been a joke, but many Latinos in Arizona are afraid it’s funny because it’s true. A group of like minded people from Anaheim, California, joined the vigil holders Sunday afternoon for a short rally and prayer. About 40 people left SoCal Sunday morning, arrived at the capitol in the middle of afternoon stayed for a couple of hours and then boarded their bus and went home. The trip was scheduled so they wouldn’t have to spend any money here. Like many people across the US, they are boycotting the Grand Canyon State to show their opposition to SB 1070. There are more photos from the vigil in my archive and available from ZUMA Press.